"Stettin" redirects here. For other uses, see Stettin (disambiguation). Szczecin (Polish: [ˈʂtʂɛtɕin] ( listen); German: Stettin [ʃtɛˈtiːn], Swedish: Stettin [stɛˈtiːn]; known also by other alternative names) is the capital and largest city of the West Pomeranian Voivodeship in Poland. Located near the Baltic Sea and the German border, it is a major seaport and Poland's seventh-largest city. As of June 2018, the population was 403,274. 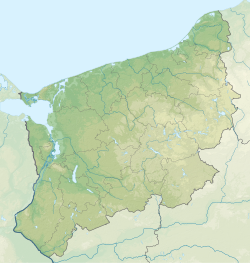 Szczecin is located on the Oder, south of the Szczecin Lagoon and the Bay of Pomerania. The city is situated along the southwestern shore of Dąbie Lake, on both sides of the Oder and on several large islands between the western and eastern branches of the river. Szczecin is adjacent to the town of Police and is the urban centre of the Szczecin agglomeration, an extended metropolitan area that includes communities in the German states of Brandenburg and Mecklenburg-Vorpommern. The city's recorded history began in the 8th century as a Slavic Pomeranian stronghold, built at the site of the Ducal castle. In the 12th century, when Szczecin had become one of Pomerania's main urban centres, it lost its independence to Piast Poland, the Duchy of Saxony, the Holy Roman Empire and Denmark. At the same time, the House of Griffins established themselves as local rulers and the population was Christianized. After the Treaty of Stettin in 1630, the town came under the control of the Swedish Empire and became in 1648 the Capital of Swedish Pomerania until 1720, when it was acquired by the Kingdom of Prussia and then the German Empire. Following World War II Stettin became part of Poland in accordance with the Potsdam Agreement, resulting in expulsion of the pre-war German population. Szczecin is the administrative and industrial centre of West Pomeranian Voivodeship and is the site of the University of Szczecin, Pomeranian Medical University, Maritime University, West Pomeranian University of Technology, Szczecin Art Academy, and the see of the Szczecin-Kamień Catholic Archdiocese. From 1999 onwards, Szczecin has served as the site of the headquarters of NATO's Multinational Corps Northeast. Szczecin was a candidate for the European Capital of Culture in 2016. ✪ Czy to naprawdę SZCZECIN? ✪ Pomysł na weekend: Zobacz z nami Szczecin! ✪ Szczecin, Poland Travel Guide: Top things to do in Szczecin! The names "Szczecin" and "Stettin" are of Slavic origin, though the exact etymology is the subject of ongoing research. [a] In Etymological dictionary of geographical names of Poland, Maria Malec lists eleven theories regarding the origin of the name, including derivations from either: a Slavic word for hill peak, (Polish: szczyt), or the plant fuller's teasel (Polish: szczeć), or the personal name Szczota. Other medieval names for the town are Burstaborg (in the Knytlinga saga) and Burstenburgh (in the Annals of Waldemar). These names, which literally mean "brush burgh", are likely derived from the translation of the city's Slavic name (assuming derivation #2 for that). The recorded history of Szczecin began in the eighth century, as Vikings and West Slavs settled Pomerania. The Slavs erected a new stronghold on the site of the modern castle. Since the 9th century, the stronghold was fortified and expanded toward the Oder bank. Mieszko I of Poland took control of Pomerania during the Early Middle Ages and the region became part of Poland in the 10th century. Subsequent Polish rulers, the Holy Roman Empire, and the Liutician federation all aimed to control the territory. After the decline of the neighbouring regional centre Wolin in the 12th century, the city became one of the more important and powerful seaports of the Baltic Sea. In a campaign in the winter of 1121–1122, Bolesław III Wrymouth, the Duke of Poland, gained control of the region, including the city of Szczecin and its stronghold. The inhabitants were Christianized by two missions of Bishop Otto of Bamberg in 1124 and 1128. At this time, the first Christian church of Saints Peter and Paul was erected. Polish minted coins were commonly used in trade in this period. The population of the city at that time is estimated to be at around 5,000–9,000 people. Polish rule ended with Boleslaw's death in 1138. During the Wendish Crusade in 1147, a contingent led by the German margrave Albert the Bear, an enemy of Slavic presence in the region, papal legate, bishop Anselm of Havelberg and Konrad of Meissen besieged the town. There, a Polish contingent supplied by Mieszko III the Old joined the crusaders. However, the citizens had placed crosses around the fortifications, indicating they already had been Christianised. Duke Ratibor I of Pomerania, negotiated the disbanding of the crusading forces. After the Battle of Verchen in 1164, Szczecin duke Bogusław I, Duke of Pomerania became a vassal of the Duchy of Saxony's Henry the Lion. In 1173 Szczecin castellan Wartislaw II, could not resist a Danish attack and became vassal of Denmark. In 1181, Bogusław became a vassal of the Holy Roman Empire. In 1185 Bogusław again became a Danish vassal. Following a conflict between his heirs and Canute VI of Denmark, the settlement was destroyed in 1189, but the fortress was reconstructed and manned with a Danish force in 1190. While the empire restored its superiority over the Duchy of Pomerania in the Battle of Bornhöved in 1227, Szczecin was one of two bridgeheads remaining under Danish control (until 1235; Wolgast until 1241/43 or 1250). In the second half of the 12th century, a group of German tradesmen ("multus populus Teutonicorum" from various parts of the Holy Roman Empire) settled in the city around St. Jacob's Church, which was donated in 1180 by Beringer, a trader from Bamberg, and consecrated in 1187. Hohenkrug (now in Szczecin-Struga) was the first village in the Duchy of Pomerania that was clearly recorded as German (villa teutonicorum) in 1173. Ostsiedlung accelerated in Pomerania during the 13th century. Duke Barnim I of Pomerania granted Szczecin a local government charter in 1237, separating the German settlement from the Slavic community settled around the St. Nicholas Church in the neighbourhood of Kessin (Polish: Chyzin). In the charter, the Slavs were put under German jurisdiction. In 1249 Barnim I also granted Magdeburg town privileges to the town of Damm (also known as Altdamm) on the eastern bank of the Oder. Damm merged with neighbouring Szczecin on 15 October 1939 and is now the Dąbie neighbourhood. This town had been built on the site of a former Pomeranian burg, "Vadam" or "Dambe", which Boleslaw had destroyed during his 1121 campaign. On 2 December 1261, Barnim I allowed Jewish settlement in Szczecin in accordance with the Magdeburg law, in a privilege renewed in 1308 and 1371. The Jewish Jordan family was granted citizenship in 1325, but none of the 22 Jews allowed to settle in the duchy in 1481 lived in the city, and in 1492, all Jews in the duchy were ordered to convert to Christianity or leave – this order remained effective throughout the rest of the Griffin era. Stettin was part of the federation of Wendish towns, a predecessor of the Hanseatic League, in 1283. The city prospered due to its participation in the Baltic Sea trade, primarily with herring, grain, and timber; craftsmanship also prospered, and more than forty guilds were established in the city. The far-reaching autonomy granted by the House of Griffins was in part reduced when the dukes reclaimed Stettin as their main residence in the late 15th century. The anti-Slavic policies of German merchants and craftsmen intensified in this period, resulting in measures such as bans on people of Slavic descent joining craft guilds, a doubling of customs tax for Slavic merchants, and bans against public usage of their native language. The more prosperous Slavic citizens were forcibly stripped of their possessions, which were then handed over to Germans. In 1514 the guild of tailors added a Wendenparagraph to its statutes, banning Slavs. In 1570, during the reign of John Frederick, Duke of Pomerania, a congress was held at Stettin ending the Northern Seven Years' War. During the war, Stettin had tended to side with Denmark, while Stralsund tended toward Sweden – as a whole, however, the Duchy of Pomerania tried to maintain neutrality. Nevertheless, a Landtag that had met in Stettin in 1563 introduced a sixfold rise in real estate taxes to finance the raising of a mercenary army for the duchy's defense. Johann Friedrich also succeeded in elevating Stettin to one of only three places allowed to coin money in the Upper Saxon Circle of the Holy Roman Empire, the other two places being Leipzig and Berlin. Bogislaw XIV, who resided in Stettin beginning in 1620, became the sole ruler and Griffin duke when Philipp Julius, Duke of Pomerania died in 1625. Before the Thirty Years' War reached Pomerania, the city, as well as the entire duchy, declined economically due to the decrease in importance of the Hanseatic League and a conflict between Stettin and Frankfurt an der Oder. Following the Treaty of Stettin of 1630, the town (along with most of Pomerania) was allied to and occupied by the Swedish Empire, which managed to keep the western parts of Pomerania after the death of Bogislaw XIV in 1637. From the Peace of Westphalia in 1648, Stettin became the Capital of Swedish Pomerania. Stettin was turned into a major Swedish fortress, which was repeatedly besieged in subsequent wars. The Treaty of Stettin (1653) didn't change this, but due to the downfall of the Swedish Empire after Charles XII, the city went to Prussia in 1720. Instead Stralsund became Capital of the last remaining parts of Swedish Pomerania 1720-1815. Wars inhibited the city's economic prosperity, which had undergone a deep crisis during the devastation of the Thirty Years' War and was further impeded by the new Swedish-Brandenburg-Prussian frontier, cutting Stettin off from its traditional Farther Pomeranian hinterland. Due to a Plague during the Great Northern War, the city's population dropped from 6,000 people in 1709 to 4,000 in 1711. In 1720, after the Great Northern War, Sweden was forced to cede the city to King Frederick William I of Prussia. Stettin was made the capital city of the Brandenburg-Prussian Pomeranian province, since 1815 reorganised as the Province of Pomerania. In 1816 the city had 26,000 inhabitants. The Prussian administration deprived Stettin of her right to administrative autonomy, abolished guild privileges as well as its status as a staple town, and subsidised manufacturers. Also, colonists were settled in the city, primarily Huguenots. In October 1806, during the War of the Fourth Coalition, believing that he was facing a much larger force, and after receiving a threat of harsh treatment of the city, the Prussian commander Lieutenant General Friedrich von Romberg agreed to surrender the city to the French led by General Lassalle. In fact, Lassalle had only 800 men against von Romberg's 5,300 men. In March 1809 Romberg was convicted and sentenced to life imprisonment for giving up Stettin without a fight. From 1683 to 1812, one Jew was permitted to reside in Stettin, and an additional Jew was allowed to spend a night in the city in case of "urgent business". These permissions were repeatedly withdrawn between 1691 and 1716, also between 1726 and 1730 although else the Swedish regulation was continued by the Brandenburg-Prussian administration. Only after the Prussian Edict of Emancipation of 11 March 1812, which granted Prussian citizenship to all Jews living in the kingdom, did a Jewish community emerge in Stettin, with the first Jews settling in the town in 1814. Construction of a synagogue started in 1834; the community also owned a religious and a secular school, an orphanage since 1855, and a retirement home since 1893. The Jewish community had between 1,000 and 1,200 members by 1873 and between 2,800 and 3,000 members by 1927–28. These numbers dropped to 2,701 in 1930 and to 2,322 in late 1934. After the Franco Prussian war of 1870–1871, 1,700 French POWs were imprisoned there in deplorable conditions, resulting in the death of 600 of them; after the Second World War monuments in their memory were built by the Polish authorities. Until 1873, Stettin remained a fortress. When part of the defensive structures were levelled, a new neighbourhood, Neustadt ("New Town") as well as water pipes, sewerage and drainage, and gas works were built to meet the demands of the growing population. Szczecin was on the path of Polish forces led by Stefan Czarniecki moving from Denmark, which led his forces to the city, is today mentioned in the Polish anthem, and numerous locations in the city honour his name. Stettin developed into a major Prussian port and became part of the German Empire in 1871. While most of the province retained its agrarian character, Stettin was industrialised, and its population rose from 27,000 in 1813 to 210,000 in 1900 and 255,500 in 1925. Major industries that flourished in Stettin from 1840 were shipbuilding, chemical and food industries, and machinery construction. Starting in 1843, Stettin became connected to the major German and Pomeranian cities by railways, and the water connection to the Bay of Pomerania was enhanced by the construction of the Kaiserfahrt (now Piast) canal. The city was also a scientific centre; for example, it was home to the Entomological Society of Stettin. On 20 October 1890, some of the city's Poles created the "Society of Polish-Catholic Workers" in the city, one of the first Polish organisations. In 1897 the city's ship works began the construction of the pre-dreadnought battleship Kaiser Wilhelm der Grosse. In 1914, before World War I, the Polish community in the city numbered over 3,000 people. These were primarily industrial workers and their families who came from the Poznań (Posen) area and a few local wealthy industrialists and merchants. Among them was Kazimierz Pruszak, director of the Gollnow industrial works and a Polish patriot, who predicted the eventual "return" of Szczecin to Poland. During the interwar period, Stettin was Weimar Germany's largest port on the Baltic Sea, and her third-largest port after Hamburg and Bremen. Cars of the Stoewer automobile company were produced in Stettin from 1899 to 1945. By 1939, the Reichsautobahn Berlin–Stettin was completed. Stettin played a major role as an entrepôt in the development of the Scottish herring trade with the Continent, peaking at an annual export of more than 400,000 barrels in 1885, 1894 and 1898. Trade flourished till the outbreak of the First World War and resumed on a reduced scale during the years between the wars. In the March 1933 German elections to the Reichstag, the Nazis and German nationalists from the German National People's Party (or DNVP) won most of the votes in the city, together winning 98,626 of 165,331 votes (59.3%), with the NSDAP getting 79,729 (47.9%) and the DNVP 18,897 (11.4%). In 1935 the Wehrmacht made Stettin the headquarters for Wehrkreis II, which controlled the military units in all of Mecklenburg and Pomerania. It was also the area headquarters for units stationed at Stettin I and II; Swinemünde; Greifswald; and Stralsund. In the interwar period, the Polish minority numbered 2,000 people. A number of Poles were members of the Union of Poles in Germany (ZPN), which was active in the city from 1924. A Polish consulate was located in the city between 1925 and 1939. On the initiative of the consulate and ZPN activist Maksymilian Golisz, a number of Polish institutions were established, e.g., a Polish Scout team and a Polish school. German historian Musekamp writes, "however, only very few Poles were active in these institutions, which for the most part were headed by employees of the [Polish] consulate." The withdrawal of the consulate from these institutions led to a general decline of these activities, which were in part upheld by Golisz and Aleksander Omieczyński. Intensified repressions by the Nazis, who exaggerated the Polish activities to propagate an infiltration, led to the closing of the school. In 1938 the head of Szczecin's Union of Poles unit, Stanisław Borkowski, was imprisoned in Oranienburg. In 1939 all Polish organisations in Stettin were disbanded by the German authorities. Golisz and Omieczyński were murdered during the war. According to Musekamp, the role of the pre-war Polish community was exaggerated for propagandistic purposes in post-war Poland which made "the numerically insignificant Polonia of Stettin... probably the best-researched social group" in the history of the city". After the defeat of Nazi Germany, a street in Szcecin was named after Golisz. During World War II, Stettin was the base for the German 2nd Motorised Infantry Division, which cut across the Polish Corridor and was later used in 1940 as an embarkation point for Operation Weserübung, Germany's assault on Denmark and Norway. On 15 October 1939, neighbouring municipalities were joined to Stettin, creating Groß-Stettin, with about 380,000 inhabitants, in 1940. The city had become the third-largest German city by area, after Berlin and Hamburg. As the war started, the number of non-Germans in the city increased as slave workers were brought in. The first transports came in 1939 from Bydgoszcz, Toruń and Łódź. They were mainly used in a synthetic silk factory near Szczecin. The next wave of slave workers was brought in 1940, in addition to PoWs who were used for work in the agricultural industry. According to German police reports from 1940, 15,000 Polish slave workers lived within the city. During the war, 135 forced labour camps for slave workers were established in the city. Most of the 25,000 slave workers were Poles, but Czechs, Italians, Frenchmen and Belgians, as well as Dutch citizens, were also enslaved in the camps. In February 1940, the Jews of Stettin were deported to the Lublin reservation. International press reports emerged, describing how the Nazis forced Jews, regardless of age, condition and gender, to sign away all property and loaded them onto trains headed to the camp, escorted by members of the SA and SS. Due to publicity given to the event, German institutions ordered such future actions to be made in a way unlikely to attract public notice. Allied air raids in 1944 and heavy fighting between the German and Soviet armies destroyed 65% of Stettin's buildings and almost all of the city centre, the seaport, and local industries. Polish Home Army intelligence assisted in pinpointing targets for Allied bombing in the area of Stettin. The city itself was covered by the Home Army's "Bałtyk" structure, and Polish resistance infiltrated Stettin's naval yards. Other activities of the resistance consisted of smuggling people to Sweden. Nearly 400,000 Germans fled or were expelled from Stettin in 1945, and that the city was severely underpopulated for the next 30 years. [citation needed] The Soviet Red Army captured the city on 26 April. Polish authorities tried to gain control, but in the following month, the Polish administration was twice forced to leave. Finally the permanent handover occurred on 5 July 1945. In the meantime, part of the German population had returned, believing it might become part of the Soviet occupation zone of Germany, and the Soviet authorities had already appointed the German Communists Erich Spiegel and Erich Wiesner as mayors. Stettin is located mostly west of the Oder river, which was expected to become Poland's new western border, placing Stettin in East Germany. This would have been in accordance with the Potsdam Agreement between the victorious Allied Powers, which envisaged the new border to be in "a line running from the Baltic Sea immediately west of Swinemünde, and thence along the Oder River[...]". Because of the returnees, the German population of the town swelled to 84,000. The mortality rate was at 20%, primarily due to starvation. However, Stettin and the mouth of the Oder River (German: Stettiner Zipfel) became Polish on 5 July 1945, as had been decided in a treaty signed on 26 July 1944 between the Soviet Union and the Soviet-controlled Polish Committee of National Liberation (PKWN) (also known as "the Lublin Poles", as contrasted with the London-based Polish government-in-exile). On 4 October 1945, the decisive land border of Poland was established west of the 1945 line, but it excluded the Police (Pölitz) area, the Oder river itself, and the Szczecin port, which remained under Soviet administration. The Oder river was handed over to Polish administration in September 1946, followed by the port between February 1946 and May 1954. After World War II the city was transferred to Poland. Szczecin was transformed from a German into a Polish city. As the flight and expulsion of the German population went on, the Poles expelled from the East were greeted by the new authorities. To ease the tensions between settlers from different regions, and help overcome fear caused by the continued presence of the Soviet troops, a special event was organised in April 1946 with 50,000 visitors in the partly destroyed city centre. Settlers from Central Poland made up about 70% of Szczecin's new population. In addition to Poles, Ukrainians from Polish areas annexed by the Soviet Union settled there. In 1945 and 1946 the city was the starting point of the northern route used by the Jewish underground organisation Brichah to channel Jewish DPs from Central and Eastern Europe to the American occupation zone. Szczecin was rebuilt, and the city's industry was expanded. At the same time, Szczecin became a major Polish industrial centre and an important seaport (particularly for Silesian coal) for Poland, Czechoslovakia, and East Germany. Cultural expansion was accompanied by a campaign resulting in the "removal of all German traces". In 1946 Winston Churchill prominently mentioned Szczecin in his Iron Curtain speech: "From Stettin in the Baltic to Trieste in the Adriatic an iron curtain has descended across the Continent". The 1962 Szczecin military parade led to a road traffic accident in which a tank of the Polish People's Army crushed bystanders, killing seven children and injuring many more. The resultant panic in the crowd led to further injuries in the rush to escape. The incident was covered up for many years by the Polish communist authorities. The city witnessed anti-communist revolts in 1970. In 1980, one of the four August Agreements, which led to the first legalisation of the trade union Solidarity, was signed in Szczecin. The introduction of martial law in December 1981 met with a strike by the dockworkers of Szczecin shipyard, joined by other factories and workplaces in a general strike. All these were suppressed by the authorities. Pope John Paul II visited the city on 11 June 1987. Another wave of strikes in Szczecin broke out in 1988 and 1989, which eventually led to the Round Table Agreement and first semi-free elections in Poland. Szczecin has been the capital of the West Pomeranian Voivodeship since 1999. Szczecin has an oceanic climate (Köppen: Cfb) with some humid continental (Dfb) characteristics in normal not updated, typical of Western Pomerania. The winters are cold more than on the immediate coast and the summers are warm, but still with some moderation, especially the Baltic Sea. The average air temperature in Szczecin ranges from 8 to 8.4 °C. The hottest month is July with a temperature of 15.8 ° C to 20.3 °C, the coldest January from -4.1 ° C to 2.6 °C. Air temperature below 0 °C occurs on average over 86 days a year, most frequently in January and February. The average annual rainfall is 537 mm, the average rainfall in the cool half-year is 225 mm, and in the warmer half year is 350 mm. On average, 167 days with precipitation occurs. Szczecin's architectural style is due to trends popular in the last half of the 19th century and the first years of the 20th century: Academic art and Art Nouveau. In many areas built after 1945, especially in the city centre, which had been destroyed due to Allied bombing, social realism is prevalent. The city has an abundance of green areas: parks and avenues – wide streets with trees planted in the island separating opposing traffic (where often tram tracks are laid); and roundabouts. Szczecin's city plan resembles that of Paris, mostly because Szczecin was rebuilt in the 1880s according to a design by Georges-Eugène Haussmann, who had redesigned Paris under Napoléon III. This pattern of street design is still used in Szczecin, as many recently built (or modified) city areas include roundabouts and avenues. During the city's reconstruction in the aftermath of World War II, the communist authorities of Poland wanted the city's architecture to reflect an old Polish Piast era. Since no buildings from that time existed, instead Gothic as well as Renaissance buildings were picked as worthy of conservation. The motivation behind this decision was that Renaissance architecture was used by the Griffin dynasty, which had Slavic roots and was seen to be of Piast extraction by some historians (later the Piast myth was replaced by a local Griffin myth, whereby the Slavic roots of the Griffin dynasty were to justify the post-war Polish presence in Pomerania). This view was manifested, for example, by erecting respective memorials, and the naming of streets and enterprises, while German traces were replaced by symbols of three main categories: Piasts, the martyrdom of Poles, and gratitude to the Soviet and Polish armies which had ended the Nazi German genocide of the Polish people. The ruins of the former Griffin residence, initially renamed "Piast Palace", also played a central role in this concept and were reconstructed in Renaissance style, with all traces of later eras removed. In general, post-Renaissance buildings, especially those from the 19th and early 20th centuries, were deemed unworthy of conservation until the 1970s, and were in part used in the "Bricks for Warsaw" campaign (an effort to rebuild Warsaw after it had been systematically razed following the Warsaw Uprising): with 38 million bricks, Szczecin became Poland's largest brick supplier. The Old Town was rebuilt in the late 1990s, with new buildings, some of which were reconstructions of buildings destroyed in World War II. The Gothic monuments preserved to this day are parts of European Route of Brick Gothic, along with monuments of other Pomeranian cities, e.g. Stargard, Kamień Pomorski, Sławno and Chełmno. A portion of the Szczecin Landscape Park in the forest of Puszcza Bukowa lies within Szczecin's boundaries. Dzielnica Śródmieście (City Centre) includes: Centrum, Drzetowo-Grabowo, Łękno, Międzyodrze-Wyspa Pucka, Niebuszewo-Bolinko, Nowe Miasto, Stare Miasto, Śródmieście-Północ, Śródmieście-Zachód, Turzyn. Dzielnica Północ (North) includes: Bukowo, Golęcino-Gocław, Niebuszewo, Skolwin, Stołczyn, Warszewo, Żelechowa. Dzielnica Zachód (West) includes: Arkońskie-Niemierzyn, Głębokie-Pilchowo, Gumieńce, Krzekowo-Bezrzecze, Osów, Pogodno, Pomorzany, Świerczewo, Zawadzkiego-Klonowica. Dzielnica Prawobrzeże (Right-Bank) includes: Bukowe-Klęskowo, Dąbie, Kijewo, Osiedle Majowe, Osiedle Słoneczne, Płonia-Śmierdnica-Jezierzyce, Podjuchy, Wielgowo-Sławociesze, Załom, Zdroje, Żydowce-Klucz. Babin, Barnucin, Basen Górniczy, Błędów, Boleszyce, Bystrzyk, Cieszyce, Cieśnik, Dolina, Drzetowo, Dunikowo, Glinki, Grabowo, Jezierzyce, Kaliny, Kępa Barnicka, Kijewko, Kluczewko, Kłobucko, Kniewo, Kraśnica, Krzekoszów, Lotnisko, Łasztownia, Niemierzyn, Odolany, Oleszna, Podbórz, Port, os.Przyjaźni, Rogatka, Rudnik, Sienna, Skoki, Słowieńsko, Sosnówko, Starków, Stoki, Struga, Śmierdnica, os.Świerczewskie, Trzebusz, Urok, Widok, Zdunowo. Up to the end of World War II, the vast majority of the population of Stettin were Lutheran Protestants. Historically, the number of inhabitants doubled from 6,081 in 1720, to 12,360 in 1740, and reached 21,255 in 1812, with only 476 Catholics and 5 Jews. By 1852 the population was 48,028, and 58,487 ten years later (1861), including 1,065 Catholics and 1,438 Jews. In 1885 it was 99,543, and by 1905 it ballooned to 224,119 settlers (incl. the military), among them 209,152 Protestants, 8,635 Catholics and 3,010 Jews. In the year of the invasion of Poland the number of inhabitants reached 268,421 persons according to German sources including 233,424 Protestants, 10,845 Catholics, and 1,102 Jews. The current population of Szczecin by comparison was 406,427 in 2009. Following the 2014 Ukrainian revolution, Szczecin, much like most other major urban centers in Poland, saw an unprecedented influx of foreign nationals, an overwhelming majority of them Ukrainians; in July 2017 26 thousand of them were officially registed as living and working in Szczecin, with unofficial estimates going as high as 50 thousand, thus making up more than 10% of the city's inhabitants. Recently, the city has favoured the centre right Civic Platform. Nearly two-thirds (64.54%) of votes cast in the second round of the 2010 presidential election went to the Civic Platform's Bronisław Komorowski, and in the following year's Polish parliamentary election the party won 46.75% of the vote in the Szczecin constituency with Law and Justice second garnering 21.66% and Palikot's Movement third with 11.8%. Sławomir Nitras, PO, former MP in the Polish lower house of Parliament. Bogusław Liberadzki, SLD-UP, economist, former Minister of Transport. Marek Gróbarczyk, PiS, engineer and manager, Minister of Maritime Economy. Szczecin's History Museum (Polish Muzeum Historii Szczecina) in the Old Town Hall, Szczecin, Księcia Mściwoja II Street. The Old Art Gallery of the National Museum, Staromłyńska Street 27. Planned investments: Dialogue Center Breakthroughs (Polish Centrum Dialogu Przełomy) and Maritime Science Centre (Polish Muzeum Morskie – Centrum Nauki). EUREKA – the miracles of science. The Castle Museum (Polish Muzeum Zamkowe) in the Pomeranian Dukes' Castle, Szczecin. Museum of Technique and Communication – Art Depot (Polish Muzeum Techniki i Komunikacji – Zajezdnia Sztuki). The current local cuisine in Szczecin was mostly shaped in the mid-20th century by people who settled in the city from other parts and regions of Poland, including the former Eastern Borderlands. The most renowned dishes of the area are pasztecik szczeciński and paprykarz szczeciński. Pasztecik szczeciński is a deep-fried yeast dough stuffed with meat or vegetarian filling, served in specialised bars as a fast food. The first bar serving pasztecik szczeciński, Bar "Pasztecik" founded in 1969, is located on Wojska Polskiego Avenue 46 in the centre of Szczecin. Pasztecik szczeciński is usually served with clear borscht. Paprykarz szczeciński is a paste made by mixing fish paste (around 50%) with rice, onion, tomato concentrate, vegetable oil, salt and a mixture of spices including chili powder to put it on a sandwich. It is available in most grocery stores in the country. The word szczeciński in both names, pasztecik szczeciński and paprykarz szczeciński, is an adjective from the name of the city of Szczecin, the place of its origin. There are many popular professional sports teams in Szczecin area. The most popular sport today is probably football (thanks to Pogoń Szczecin being promoted to play in Ekstraklasa in the 2012/2013 season). Amateur sports are played by thousands of Szczecin citizens and also in schools of all levels (elementary, secondary, university). As can be seen above, many teams in Szczecin are named after Pogoń Lwów, a team from the Eastern Borderlands. Every year in September the men's tennis tournament Pekao Szczecin Open is held in Szczecin. Szczecin is served by Solidarity Szczecin–Goleniów Airport, which is 47 kilometres (29 miles) northeast of central Szczecin. There is also a grass airstrip within city limits, the Szczecin-Dąbie Airstrip. Szczecin has a tram network comprising 12 tram lines serving 95 tram stops and measuring 110.77 km (69 mi) in length. Tram transport is operated by the Tramwaje Szczecińskie (TS). Szczecin's first horse tram opened in 1879, running from Gałczyńskiego Square to Staszica Street. In 1896 the first line using electric traction was opened. By 1900, the horse trams had been entirely replaced by electric trams. Szczecin has a bus network of 70 bus routes. Bus transport is operated by 4 companies: SPA Dąbie, SPA Klonowica, SPPK and PKS Szczecin. Of all bus routes, 50 lines are designated as normal. At nighttime, Szczecin is served by a night bus network of 16 routes. There are also 7 express bus lines, which do not serve all stops on their route. The A6 motorway (recently upgraded) serves as the southern bypass of the city, and connects to the German A11 autobahn (portions of which are currently undergoing upgrade), from where one can reach Berlin in about 90 minutes (about 150 km (93 mi)). Road connections with the rest of Poland are of lower quality (no motorways), though the S3 Expressway has improved the situation after the stretch from Szczecin to Gorzów Wielkopolski opened in 2010, and then another section connecting to A2 motorway opened in May 2014. Construction of express roads S6 and S10 to run east from Szczecin has also started, though these roads will not be fully completed in the near future. The main train station – Szczecin Główny railway station – is situated in the city centre (Kolumba Street). Szczecin has good railway connections with "Solidarity" Szczecin–Goleniów Airport and the rest of Poland, e.g., Świnoujście, Kołobrzeg, Poznań, Wrocław, Warsaw and Gdańsk. Szczecin is also connected with Germany (Berlin (Gesundbrunnen) and through Pasewalk to Neubrandenburg and Lübeck), but only by two single-track, non-electrified lines. Because of this, the rail connection between Berlin and Szczecin is much slower and less convenient than one would expect between two European cities of that size and proximity. The Port of Szczecin is the third largest port in Poland and handles almost 10 million tons of cargo annually (data from 2006). This is a harbour of the Baltic Sea and the Oder river. Over the long course of its history Szczecin has been a place of birth and of residence for many famous individuals, including Empress Catherine the Great of Russia, composer Carl Loewe, writer Alfred Döblin, actress Dita Parlo, mathematician Hermann Günther Grassmann, Roman Catholic priest Carl Lampert, poet Konstanty Ildefons Gałczyński, Helena Majdaniec - "the queen of Polish Twist", and singer Violetta Villas. Stytin, in the Annales Colbacensis. (in German) Jan Musekamp: Zwischen Stettin und Szczecin – Metamorphosen einer Stadt von 1945 bis 2001 (Between Stettin and Szczecin – a town's metamorphoses from 1945 to 2005). Wiesbaden 2010 (restricted online preview), there is also a Polish edition Między Stettinem a Szczecinem. Metamorfoza miasta od 1945 do 2005. (in German) Martin Wehrmann: Geschichte der Stadt Stettin. Stettin 1911 (reprinted in 1993 by Weltbild Verlag, Augsburg, ISBN 3-89350-119-3). (in German) W. H. Meyer: Stettin in alter und neuer Zeit (Stettin in ancient and modern times). Stettin, 1887. ^ "Local Data Bank". Statistics Poland. Retrieved 10 November 2018. Data for territorial unit 3262000. ^ "Strona domeny www.szczecin2016.pl". szczecin2016.pl. Archived from the original on 17 August 2010. ^ a b c d e f g h i j k l m n o p q r s t u v w x y Białecki, Tadeusz (1992). Historia Szczecina. Wrocław: Zakład Narodowy im. Ossolińskich. pp. 9, 20–55, 92–95, 258–260, 300–306. ^ The New Encyclopædia Britannica, Volume 11, Encyclopædia Britannica, 1998, p. 473 "In the 8th and 9th centuries Szczecin was a Slavic fishing and commercial settlement in later named Western Pomerania (Pomorze Zachodnie). 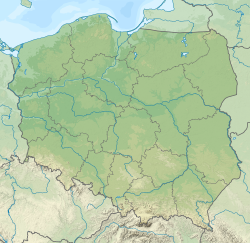 During the 10th century, it was annexed to Poland by Mieszko. ^ Jan M Piskorski, Pommern im Wandel der Zeiten, 1999, pp. 31,36,43 ISBN 83-906184-8-6 OCLC 43087092: p. 31 (yrs 967-after 1000 AD):"[...] gelang es den polnischen Herrschern sicherlich nicht, Wollin und die Odermündung zu unterwerfen." p. 36: "Von 1119 bis 1122 eroberte er schließlich das pommersche Odergebiet mit Stettin, [...]" p. 43: "[...] während Rügen 1168 erobert und in den dänischen Staat einverleibt wurde." ^ Kyra T. Inachin, Die Geschichte Pommerns, Hinstorff Rostock, 2008, pp. 15ff, ISBN 978-3-356-01044-2: pp. 14–15:"Die westslawischen Stämme der Obroditen, Lutizen und Pomoranen konnten sich lange der Eroberung widersetzen. Die militärisch überlegenen Mächte im Norden und Osten, im Süden und im Westen übten jedoch einen permanenten Druck auf den südlichen Ostseeraum aus. Dieser ging bis 1135 hauptsächlich von Polen aus. Der polnische Herzog Boleslaw III Krzywousty (Schiefmund) unterwarf in mehreren Feldzügen bis 1121 pomoranisches Stammland mit den Hauptburgen Cammin und Stettin und drang weiter gen Westen vor." p. 17: Das Interesse Waldemars richtete sich insbesondere auf das Siedlungsgebiet der Ranen, die nördlich des Ryck und auf Rügen siedelten und die sich bislang gegen Eroberer und Christianisierungsversuche gewehrt hatten. [...] und nahmen 1168 an König Waldemar I. Kriegszug gegen die Ranen teil. Arkona wurde erobert und zerstört. Die unterlegenen Ranen versprachen, das Christentum anzunehmen, die Oberhoheit des Dänenkönigs anzuerkennen und Tribut zu leisten." ^ An historical geography of Europe, 450 B.C.–A.D. 1330, Norman John Greville Pounds, Cambridge University Press 1973, p. 241, "By 1121 Polish armies had penetrated its forests, captured its chief city of Szczecin." ^ Kyra Inachim, Die Geschichte Pommerns, Hinstorff Rostock, 2008, p. 17, ISBN 978-3-356-01044-2: "Mit dem Tod Kaiser Lothars 1137 endete der sächsische Druck auf Wartislaw I., und mit dem Ableben Boleslaw III. auch die polnische Oberhoheit." ^ Heitz, Gerhard; Rischer, Henning (1995). Geschichte in Daten. Mecklenburg-Vorpommern (in German). Münster-Berlin: Koehler&Amelang. p. 163. ISBN 3-7338-0195-4. ^ a b Riis, Thomas (2003). Studien Zur Geschichte Des Ostseeraumes IV. Das Mittelalterliche Dänische Ostseeimperium. Ludwig. p. 48. ISBN 87-7838-615-2. ^ a b c Heitz, Gerhard; Rischer, Henning (1995). Geschichte in Daten. Mecklenburg-Vorpommern (in German). Münster-Berlin: Koehler&Amelang. p. 168. ISBN 3-7338-0195-4. ^ North, Michael (2008). Geschichte Mecklenburg-Vorpommerns (in German). Beck. p. 21. ISBN 3-406-57767-9. ^ Wernicke, Horst (2007). "Die Hansestädte an der Oder". In Schlögel, Karl; Halicka, Beata (eds.). Oder-Odra. Blicke auf einen europäischen Strom (in German). Lang. pp. 137–48, here p. 142. ISBN 3-631-56149-0. ^ Ślaski, Kazimierz (1987). "Volkstumswandel in Pommern vom 12. bis zum 20. Jahrhundert". In Kirchhoff, Hans Georg (ed.). Beiträge zur Geschichte Pommerns und Pommerellens. Mit einem Geleitwort von Klaus Zernack (in German). Dortmund. pp. 94–109, p. 97. ISBN 3-923293-19-4. ^ "Poland Szczecin Barrack (JPG)". Commons. ^ Schmidt, Roderich (2009). Das historische Pommern. Personen, Orte, Ereignisse. Veröffentlichungen der Historischen Kommission für Pommern (in German). 41 (2 ed.). Köln-Weimar: Böhlau. pp. 19–20. ISBN 3-412-20436-6. ^ Musekamp, Jan (2009). Zwischen Stettin und Szczecin. Veröffentlichungen des Deutschen Polen-Instituts Darmstadt (in German). 27. Harrassowitz Verlag. p. 72. ISBN 3-447-06273-8. . Quote1: "[...] Polen, die sich bereits vor Ende des Zweiten Weltkrieges in der Stadt befunden hatten. Es handelte sich bei ihnen zum einen um Industriearbeiter und ihre Angehörigen, die bis zum Ersten Weltkrieg meist aus der Gegend um Posen in das damals zum selben Staat gehörende Stettin gezogen waren [...]"
^ Schmidt, Roderich (2009). Das historische Pommern. Personen, Orte, Ereignisse. Veröffentlichungen der Historischen Kommission für Pommern (in German). 41 (2 ed.). Köln-Weimar: Böhlau. p. 20. ISBN 3-412-20436-6. ^ a b c "Deutsche Verwaltungsgeschichte Pommern, Kreis Stettin". Verwaltungsgeschichte.de. Archived from the original on 23 July 2011. Retrieved 3 June 2011. ^ a b c d Musekamp, Jan (2009). Zwischen Stettin und Szczecin. Veröffentlichungen des Deutschen Polen-Instituts Darmstadt (in German). 27. Harrassowitz Verlag. p. 73. ISBN 3-447-06273-8. ^ a b c d Musekamp, Jan (2009). Zwischen Stettin und Szczecin. Veröffentlichungen des Deutschen Polen-Instituts Darmstadt (in German). 27. Harrassowitz Verlag. p. 74. ISBN 3-447-06273-8. ^ Skóra, Wojciech (2001). Konsulat Rzeczypospolitej Polskiej w Szczecinie w latach 1925–1939. Powstanie i działalność (in Polish). Pomorska Akademia Pedagogiczna w Słupsku. p. 139. ISBN 83-88731-15-7. ^ Stolzenburg, Katrin (2002). "Hans Bernhard Reichow (1899–1974)". In Lichtnau, Bernfried (ed.). Architektur und Städtebau im südlichen Ostseeraum zwischen 1936 und 1980 (in German). Lukas Verlag. pp. 137–152, p. 140. ISBN 3-931836-74-6. ^ Musekamp, Jan (2010). Zwischen Stettin und Szczecin (in German). Deutsches Polen-Institut. p. 72. ISBN 978-3-447-06273-2. Retrieved 20 September 2011. ^ "Chronicle of the most important events in the history of Szczecin". Szczecin.pl. 2000. Archived from the original on 7 June 2011. ^ McNamara, Paul (2012). "Competing National and Regional Identities in Poland's Baltic". History of Communism in Europe. History of Communism in Europe vol. 3 / 2012. 3. Bogdan C. Iacob. pp. 30–31, p. 31. ISBN 9786068266275. ^ a b Musekamp, Jan (2006). "Der Königsplatz in Stettin als Beispiel kultureller Aneignung nach 1945". In Loew, Peter Oliver; Pletzing, Christian; Serrier, Thomas (eds.). Wiedergewonnene Geschichte. Zur Aneignung von Vergangenheit in den Zwischenräumen Mitteleuropas. Veröffentlichungen des Deutschen Polen-Instituts Darmstadt (in German). 22. Harrassowitz Verlag. pp. 19–35, p. 20. ISBN 3-447-05297-X. ^ Königseder, Angelika (1997). "Durchgangsstation Berlin. Jüdische Displaced Persons 1945–1948". In Giere, Jacqueline; et al. (eds.). Überlebt und unterwegs. Jüdische Displaced Persons im Nachkriegsdeutschland (in German). Campus Verlag. pp. 189–206, pp. 191–192. ISBN 3-593-35843-3. ^ Musekamp, Jan (2006). "Der Königsplatz in Stettin als Beispiel kultureller Aneignung nach 1945". In Loew, Peter Oliver; Pletzing, Christian; Serrier, Thomas (eds.). Wiedergewonnene Geschichte. Zur Aneignung von Vergangenheit in den Zwischenräumen Mitteleuropas. Veröffentlichungen des Deutschen Polen-Instituts Darmstadt (in German). 22. Harrassowitz Verlag. pp. 19–35, pp. 22–23. ISBN 3-447-05297-X. ^ a b "Polska.pl". polska.pl. Archived from the original on 14 October 2008. ^ a b "Uczestniczki tragedii po 45 latach" [Participants of the tragedy after 45 years]. East News (in Polish). 19 October 2007. Archived from the original on 7 November 2007. ^ "Wprowadzenie stanu wojennego w Szczecinie – Wiadomości – Szczecin". Sedinum.stetinum.pl. 13 December 2009. Archived from the original on 22 December 2015. Retrieved 3 June 2011. ^ Monika Stefanek (11 April 2008). "Papież w Szczecinie" (in Polish). GS24.pl – Serwis Głosu Szczecińskiego. Retrieved 19 April 2011. ^ "Szczecin, Poland Köppen Climate Classification (Weatherbase)". Weatherbase. Retrieved 27 December 2018. ^ "Stan środowiska miasta Szczecina". Küsteninformationssystem Odermündung. May 2004. ^ "Szczecin (12205) - WMO Weather Station". NOAA. Retrieved 27 December 2018. Archived December 27, 2018, at the Wayback Machine. ^ a b "NCDC". Archived from the original on 30 October 2016. Retrieved 30 October 2016. ^ a b Musekamp, Jan (2006). "Der Königsplatz in Stettin als Beispiel kultureller Aneignung nach 1945". In Loew, Peter Oliver; Pletzing, Christian; Serrier, Thomas (eds.). Wiedergewonnene Geschichte. Zur Aneignung von Vergangenheit in den Zwischenräumen Mitteleuropas. Veröffentlichungen des Deutschen Polen-Instituts Darmstadt (in German). 22. Harrassowitz Verlag. pp. 19–35, p. 23. ISBN 3-447-05297-X. ^ a b c Musekamp, Jan (2006). "Der Königsplatz in Stettin als Beispiel kultureller Aneignung nach 1945". In Loew, Peter Oliver; Pletzing, Christian; Serrier, Thomas (eds.). Wiedergewonnene Geschichte. Zur Aneignung von Vergangenheit in den Zwischenräumen Mitteleuropas. Veröffentlichungen des Deutschen Polen-Instituts Darmstadt (in German). 22. Harrassowitz Verlag. pp. 19–35, p. 31. ISBN 3-447-05297-X. ^ Musekamp, Jan (2006). "Der Königsplatz in Stettin als Beispiel kultureller Aneignung nach 1945". In Loew, Peter Oliver; Pletzing, Christian; Serrier, Thomas (eds.). Wiedergewonnene Geschichte. Zur Aneignung von Vergangenheit in den Zwischenräumen Mitteleuropas. Veröffentlichungen des Deutschen Polen-Instituts Darmstadt (in German). 22. Harrassowitz Verlag. pp. 19–35, p. 33. ISBN 3-447-05297-X. ^ Wawrzyniak, Joanna (2006). "Die Westgebiete in der Ideologie des polnischen Kommunismus". In Loew, Peter Oliver; Pletzing, Christian; Serrier, Thomas (eds.). Wiedergewonnene Geschichte. Zur Aneignung von Vergangenheit in den Zwischenräumen Mitteleuropas. Veröffentlichungen des Deutschen Polen-Instituts Darmstadt (in German). 22. Harrassowitz Verlag. pp. 298–319, p. 306. ISBN 3-447-05297-X. ^ Musekamp, Jan (2006). "Der Königsplatz in Stettin als Beispiel kultureller Aneignung nach 1945". In Loew, Peter Oliver; Pletzing, Christian; Serrier, Thomas (eds.). Wiedergewonnene Geschichte. Zur Aneignung von Vergangenheit in den Zwischenräumen Mitteleuropas. Veröffentlichungen des Deutschen Polen-Instituts Darmstadt (in German). 22. Harrassowitz Verlag. pp. 19–35, p. 30. ISBN 3-447-05297-X. ^ Musekamp, Jan (2006). "Der Königsplatz in Stettin als Beispiel kultureller Aneignung nach 1945". In Loew, Peter Oliver; Pletzing, Christian; Serrier, Thomas (eds.). Wiedergewonnene Geschichte. Zur Aneignung von Vergangenheit in den Zwischenräumen Mitteleuropas. Veröffentlichungen des Deutschen Polen-Instituts Darmstadt (in German). 22. Harrassowitz Verlag. pp. 19–35, p. 28. ISBN 3-447-05297-X. ^ Wirwicka, Alicja (18 July 2017). "Ponad 26 tysięcy Ukraińców mieszka w Szczecinie. Radny chce pełnomocnika". Onet.pl. Retrieved 11 April 2019. ^ "Election 2010". Prezydent2010.pkw.gov.pl. Retrieved 12 March 2013. ^ "European Election Database (EED)". Nsd.uib.no. Retrieved 12 March 2013. ^ a b c d e "Muzeum Narodowe w Szczecinie". ^ "Centrum Dialogu PRZEŁOMY MUZEUM NARODOWE W SZCZECINIE". ^ "Książnica Pomorska – Muzeum Literatury". Ksiaznica.szczecin.pl. Archived from the original on 1 September 2018. Retrieved 15 September 2011. ^ "Muzeum Techniki i Komunikacji – Zajezdnia Sztuki w Szczecinie". ^ "Biuletyn Informacji Publicznej Teatru Lalek Pleciuga w Szczecinie". ^ "Czym wyróżnia się kuchnia szczecińska? Czy znasz te przysmaki? [TOP 9, GALERIA] - szczecin.eskainfo.pl". Retrieved 24 March 2018. ^ a b c "Kuchnia szczecińska - Info Migrator Szczecin". Retrieved 24 March 2018. ^ "salps.home.pl". home.pl. Archived from the original on 28 October 2007. ^ Super User. "Drewno najlepszy naturalny surowiec". ^ a b c d e f g h i j k l m n o p "Kontakty partnerskie Miasta Szczecin". Urząd Miasta Szczecin (in Polish). Archived from the original on 18 August 2012. Retrieved 29 July 2013. ^ "Guide to Hull Humberside and general Hull information". city-visitor.com. Retrieved 29 May 2009. ^ "St. Louis Sister Cities". St. Louis Center for International Relations. Archived from the original on 13 May 2008. Retrieved 19 May 2008. Wikimedia Commons has media related to Szczecin.